During the opening night of the Injustice for Jermaine McBean Art Show at the African American Research Library the family attorney in the Jermaine McBean shooting tragedy gave a speech about the Jermaine McBean case. In his speech he provided background information on the case as well as updates on the case and ideas for how to organize around the case. Below is a brief summary of what was said. Please take a few moments to read the following summary. In July of 2013, Jermaine McBean was walking home from the nearby Pawn Shop with an unloaded air rifle over his shoulders. McBean does not point the gun at anyone or act in a threatening way, but someone called 911 to report him. Upon 3 officers arriving to the scene, they ask McBean to turn around and drop his weapon. At first McBean could not hear because he had headphones in his ears but eventually he stopped and began to turn around. As McBean began to turn around, deputy sheriff Peter Peraza shot at Jermaine 3 times. 2 bullets hit McBean and killed him. 1. Two of the officers on the scene that night were given awards for bravery in the shooting death of Jermaine McBean, including Peter Peraza– the one that pulled the trigger. – After Jermaine was killed the Police Unions and the Broward Sherriff’s Office led a campaign of lying, distortion, belittling of civilian witnesses, and cover-up with the cover-up efforts going all the way up to the Sheriff. – Only one pastor in Broward County has come forward and actively supported the McBean family because Sherriff Scott Israel has co-opted the clergy by offering jobs and other benefits. – The union has been heavily involved. The Police Union would have fundraisers at bars to raise money for representation for Peter Peraza. The Union also began making threatening phone calls to the state attorney’s office and posted horrific things on social media about the state attorney. – The Police Union hired 4 full time investigators to dig up stuff about Jermaine to make him look bad. – Jermain McBean was an engineer and head of technology at a major advertising firm. He decided on a whim to buy a BB gun. McBean walked down the road to a pawnshop and while returning home with the unloaded air rifle over his shoulders civilians call into 911 and 3 officers arrive on the scene. Jermaine turns into his apartment complex, at which point the cops shouted for Jermaine to drop the weapon. Jermaine could not hear because he had headphones in his ears. As Jermaine stops and begins to turn around, Peraza shoots and kills McBean. – 2 of the officers were given an award for “bravery” at the African American Research Library. – Detective and photographer illegally entered into Jermaine’s apartment to do a “welfare check” without a warrant. One of the Sherriff’s lawyers says he found a mass of prescription medicine bottles on one of McBean’s tables in his apartment. 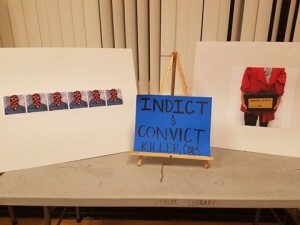 This was intended to show that Jermaine was psychotic and a real danger to the officer who shot him. But the pictures from the photographer do not show any bottles on the table in the apartment. – The investigators have dug into Jermaine’s past to dig up incidents from Jermaine’s history with bipolar disorder. Jermaine sometimes needed his medications adjusted and would check himself into a treatment facility to get his medication adjusted. The investigators distorted one of these situations to make it seem like Jermaine was involuntarily baker acted and suicidal. – A few months ago, Peraza’s attorney filed a motion to dismiss the case based on Stand Your Ground. State attorney responded that Stand Your Ground does not apply to police officers. The judge on the case chose to have the hearing anyways during which he decided that Peraza was using justified self-defense. – Decision is currently being appealed.